Nicolai Ghiaurov, Vladimir Atlantov, Paata Burchuladze et al. 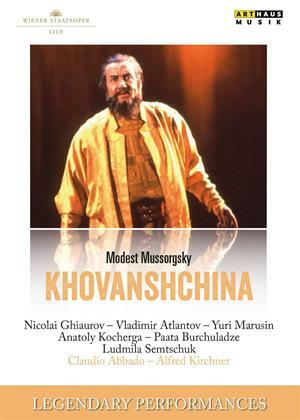 "Khovanshchina" is a work of immense power and humanity, set at the time when Peter the Great assumed power in Russia, a turning point in Russia's history when old forces came into conflict with new Political intrigue, religious persecution, the tragedy of a nation, all form a backdrop against which individual dramas are acted out. The great Bulgarian bass Nicolai Ghiaurov sings Prince Ivan Khovansky, the leader of the revolutionary Streltsys, and Paata Burchuladze sings Dosifey, the leader of the Old Believers. Fellow Russians, including Ludmila Semtschuk as Marfa and Vladimir Atlantov as Khovansky's son, complete this formidable cast. In addition to the fantastic singing in a totally balanced ensemble, Maestro Claudio Abbado offers the greatness of Mussorgsky's music.